Beth Beurkens, M.A. 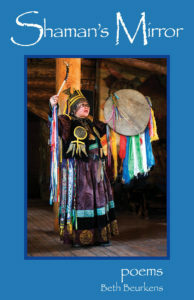 has been a teacher of shamanism and a vision quest guide for over twenty-three years. She is a faculty member at the Foundation for Shamanic Studies, instructor at Rogue Community College and the School of Women & Earth (Switzerland), and a teacher of creative writing. Beth leads dynamic seminars in North America and in Europe and has a shamanic healing practice in Ashland, Oregon and Basel, Switzerland. Beth has taught religion and spirituality courses at numerous California colleges for thirty-two years and holds an M.A. in philosophy from the University of California, Santa Barbara. She has also studied extensively with Michael Harner and Alicia Luengas Gates. In addition, Beth is an ordained minister in the Circle of the Sacred Earth and the author of two books of poetry, “Shaman’s Mirror” and “Shaman’s Eye”, and the “Shaman: Spirit Walker” 2010 and 2011 wall calendars.